Ever since German watchmaker Henricg Globel pioneered the world’s first true light bulb in 1854, it has been a practical saving grace for civilization and a universal symbol for innovative epiphanies—magically appearing over the heads of cartoon characters looking to thwart other animated opponents. The light bulb went through various phases of development with the help of other inventors like Henry Woodward, Matthew Evans, Sir Joseph Wilson Swan, and of course, Thomas Edison who purchased the 1875 patent from Woodward and Evans. From 1880 to 1925, the concept of an incandescent frosted light bulb with a long-lasting tungsten filament was nearly perfected. What followed was a period of relative stagnation. It took 66 years for the next breakthrough when Philips came out with a bulb that could last 60,000 hours thanks to magnetic induction. Since 1991, light bulbs have continued to evolve into the more efficient LED bulbs, but those suckers retailed at a whopping $45 apiece … until now. 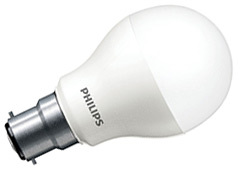 Along with Cree’s A-19 bulb, Philips is leading the charge once again with a cheaper LED that can last up to 20 years. Through a partnership with Home Depot, the sticker price on the Philips 11-watt A19 LED bulb is dropping from $25 to $17, and utility rebates across the nation can bring the price down to $10. The potential for long-term efficiency and environmental impact is huge. According to the Department of Energy, replacing every incandescent 60-watt bulb in America with a Philips LED would save $3.9 billion in electricity costs just in the first year while simultaneously cutting carbon emissions.